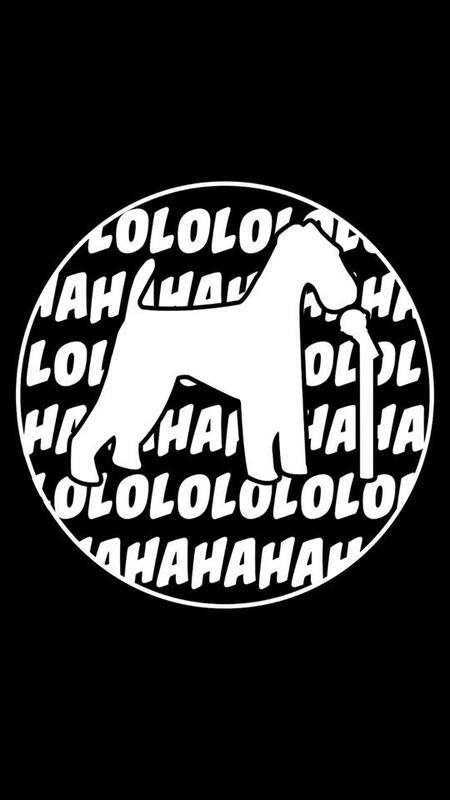 Thursday Night Therapy is a new weekly comedy showcase at The Airedale happening every Thursday night and featuring up and coming local talent. Leave the stress at work and unwind with an evening of fresh humor. This week's show features Charity Sade, Dee Ahmed, Sandi Benton and Alli Hanley. For more events please check out @FreeinDCBlog on twitter and the Free in DC page on facebook, search for "Free in DC" or click here! Much of the event content I cover comes from facebook and I don't always have time to craft individual posts on this site for every event I come across and I often post links to events on @FreeinDCBlog on twittter and/or FreeinDC on facebook that aren't on the main site. I tweet most every day, focusing on events happening that day, and some other events coming soon or ones that you might not find on the main site or on facebook. Also, if you aren't a twitter user you can just look at the page without needing to sign up for an account! Get half-price tickets! Just $10 + fee with FREEINDC promo code! for a total of $12.24 for one ticket. Even better, you can get two tickets for $15 plus fee for a total of just $17.55 for two people! Venue is styled like a black box theater and is open to 18+ with no minimum purchase. Note: All tickets must be shown at the door in print format or with the online ticket stub. 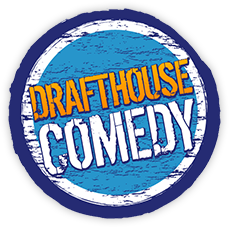 Be sure to purchase tickets on the Drafthouse site or on eventbrite to get the discount price! 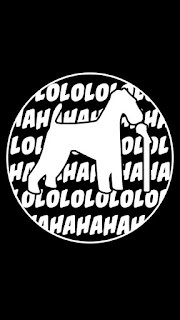 Comedy-Ish is bringing some of the most talented comedians from all over the US and Canada to DC every month now! You may have seen some of these comedians on Comedy Central, ComicView, B.E.T, MTV,VH1, Conan, and Late Night with Jimmy Fallon. 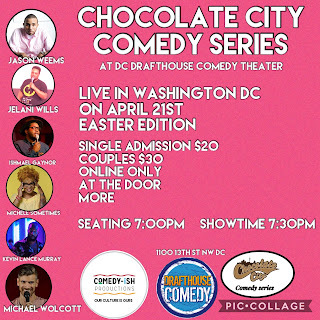 In addition to headliner Jason Weems, this month's show will be hosted by Ishmael J. Gaynor (Gotham, Comedywire) and will feature: Jelani Wills, Michele Sometimes (Brainy Girl Productions), Kevin Lance Murray and Michael Wolcott. About the venue: The folks from Arlington Drafthouse have a comedy arts performance space in the heart of DC at 13th & L St NW, Drafthouse Comedy is styled after a black box theater, with tall ceilings, great sight lines, and an intimate setting. The venue has beer, wine, liquor, and some light fare available for purchase. There are no minimum purchase requirements for patrons, nor is there table-side service. 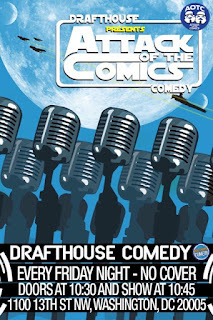 Attack of the Comics Friday Night Comedy Show at Drafthouse! Black box style venue open to those 18+ FYI college students! 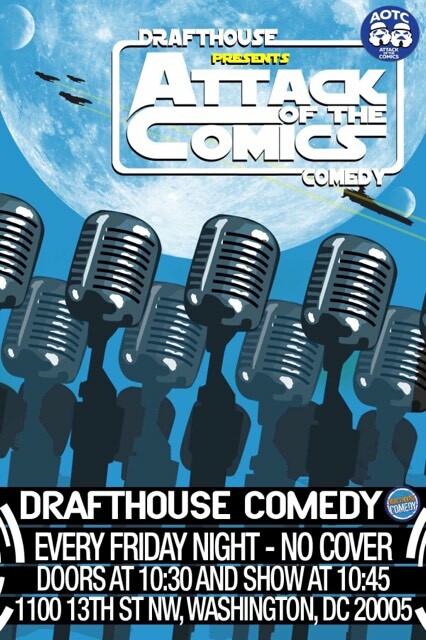 Drafthouse Comedy presents Attack of the Comics: DC's longest running Stand-up Open Mic, because seasoned comics need to work things out, and young comics need to work things out and sometimes they come together on the same stage, and at a venue open to those 18 and up! Of course drinks are available for those 21+ but no minimum purchase is required. Laughing highly encouraged though. The Meditation Talk and Meditation at 11:00 am is recommended for new folks. Feel free to arrive when you can to meditate with the group in a silent format so if you are an experienced meditator you are welcome to arrive anytime starting from 10:00 am for a silent meditation sit. Vegetarian lunch is provided after the meditation talk. at noon, for those who participate in the morning program. The Science of Spirituality Meditation DC Center opened in the Fall of 2013 and offers many free workshops and events. The center focuses on using the practice of Jyoti Meditation. 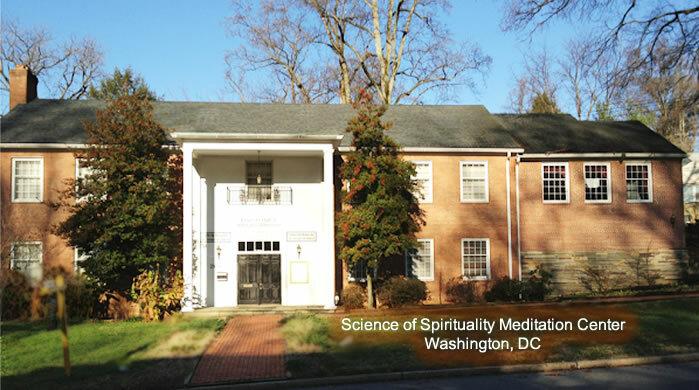 Science of Spirituality has been offering free meditation workshops actively in the DC area since 1953. As part of an international, nonprofit, multi-faith organization consisting of two thousand centers and a million members world-wide, Science of Spirituality welcomes the community to participate in its meetings and activities. The group’s president is Sant Rajinder Singh Ji Maharaj, known for his books on meditation and spirituality, and for leading conferences and workshops promoting love, unity, and peace, in all lands and among all peoples, through the practice of meditation. Science of Spirituality also offers free meditation workshops at area libraries. You can learn more about SOS DC and Jyoti Meditation on their site and follow them on twitter @SOSMeditate. at the intersection of Cathedral and Arizona Ave.
Metro: Best reached by car or car sharing service. You can see metro trip-planner for best bus access, the M4 and D6 buses both have stops pretty close by but they don't run often. For those with cars, street parking is available easily in this residential neighborhood. For those without cars, you may want to take uber, lyft, via or a car sharing service like car2go, zipcar or getaround there from wherever you are. The nearest Metro station is Tenleytown. It's a 1.8 miles drive from the metro, see map, about six minutes. Want to get fit? Connect on Fitiverse to find fun, new ways to work out! You can also find fitness buddies and free activities and classes in your area! Fitiverse is local, social network that will help you to find new, fun and social ways to workout! Fitiverse focuses on fitness and connects you with compatible workout buddies who have access to the same fitness zones, which are like neighborhoods. Fitiverse is Free to join! 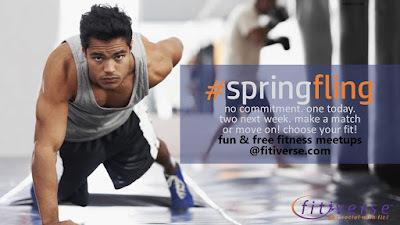 Find Free Workouts, Yoga Classes, Meet-ups and more, on Fitiverse. The local place to go for Free Fitness activities! Create your free account here! If you're wondering why am I sharing Fitiverse on Free in DC when technically it's not an arts, culture or consciousness event, it is because Fitiverse shares a similar mission, to help people connect to fabulous, local, free things to do. In their case, they just focus on fitness. It's also free to join! The site was founded by two brothers who live in the DC area who share a passion for fitness and well-being. They wanted to help others in the greater community find people who live nearby, share similar schedules and are interested in similar ways of working out and having fun. Create your free account to find some free activities, have some fun burning calories and maybe even make some new friends while you are at it. Arrive before 8:30cpm to bypass the $4 cover charge! Every Monday you can enjoy a comedy open mic and magic show! "Hocus Joke Us" is now hosted by comedian Nathan Luft and mentalist and magician Alain Nu "The Man Who Knows Mondays at Madams Organ on their second floor stage. Local comedians come by to share their work throughout the night. Line-up varies each week. The original show along this same line was started by Haywood Turnipseed Jr. some years ago under Madam's Magical Mondays and The Dark Side. 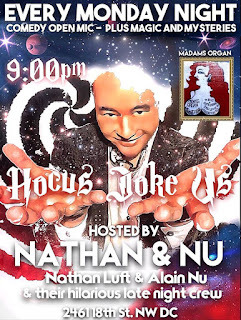 The torch has now been passed on to Nathan and Alain as they continue the show with a new name, "Hocus Joke Us." Mentalist Alain Nu, is known as "The Man Who Knows." He has starred in his own TV specials on TLC, called "The Mysterious World Of Alain Nu," has performed all over the world at casinos, on cruise ships, and in theatres. He may be one of the most interesting people living in the DC area that you have never heard of before. His take on magic and the way we think is truly unique and worth checking out! Metro: Woodley Park or Columbia Heights and take the Circulator bus to Adams Mill/ 18th St stop by the FedEx or walk, about 15 minutes from either station, or you can catch the 42 or 43 bus from Connecticut Ave or Dupont Circle toward Mt Pleasant and get off at 18th & Columbia Rd. The 90 bus lines and L2 bus also go to 18th & Columbia if that is better for you. See metro trip-planner for best options. You can also take uber or lyft there. See new user promotions below. UPCOMING & ONGOING: YOGA & MEDITATION: More Free & Low-Cost Yoga & Meditation Classes at Yoga Studios in DC and Metro VA & MD! Free & Low Cost Community Yoga & Meditation Classes in DC! Below is a list of some of the more popular centers and studios that offer free, donation-based, and reduced price yoga and meditation lasses as part of their weekly schedules. If you know of any other studios or places where you can find yoga classes that are free, by donation or $10 or less, feel free to email me over gmail at freeindcblog, comment on Free in DC's facebook page or send me a tweet @FreeinDCBlog. Organized alphabetically by Studio/ Venue Name. Please message me to let me know if there are any changes to note in this list. One hour Community Class "Flow for $5" on Fridays at 4:30pm I am pretty sure this is a heated yoga studio so you may want to call them to check before you sign up for this class. Description online simply says: "These fun classes are taught by our teachers-in-training. Following our all-levels format, these classes offer an opportunity for you to support the development of our teachers in training, and at the same time offer a reduced rate as an opportunity to give back to the broader yoga community." View schedule here. From their website: "Our studio has a strong commitment to making yoga accessible to everyone in our community, regardless of income. We are offering $10 community yoga classes every day of the week. Check out our class schedule to see which classes are only $10. These reduced $10 classes can only be purchased at the studio. ***Passes not available online, only in person. *** $10 Yoga Policies: *If you have a membership or intro special, you do NOT need to pay in addition for this class *Purchases that expire are not valid for extension, roll-over, or refund. *Not eligible for non-profit/student rate *Not eligible as credit to be applied to a regularly priced class, intro pass, class package, or OM Pass *Only valid for classes listed online as $10 class" They also offer "Namaste Day - free classes all day: "One day out of the month, the studio offers the community an opportunity to enjoy the invigorating, challenging, joyful, sweaty, and celebratory yoga classes we have to offer....for FREE. ***Members and pass holders can guarantee their spot by signing up in advance. Classes will fill up on a first come, first serve basis, so show up early." Tranquil Space - Update from April 24, 2018: The Dupont Circle location has $10 community classes Wednesday night at 8:00pm and Friday night at 7:00pm. Arlington location does not have any at the moment, though they tell me they are working on it! Unity Woods - Bethesda, MD location only. $10 drop-in Community Class on Fridays, 6:00pm - 7:00pm. This class may be followed by a free chanting class, Soul-Soothing Chanting, from 7:10pm - 7:40pm. See schedule and find more info here. 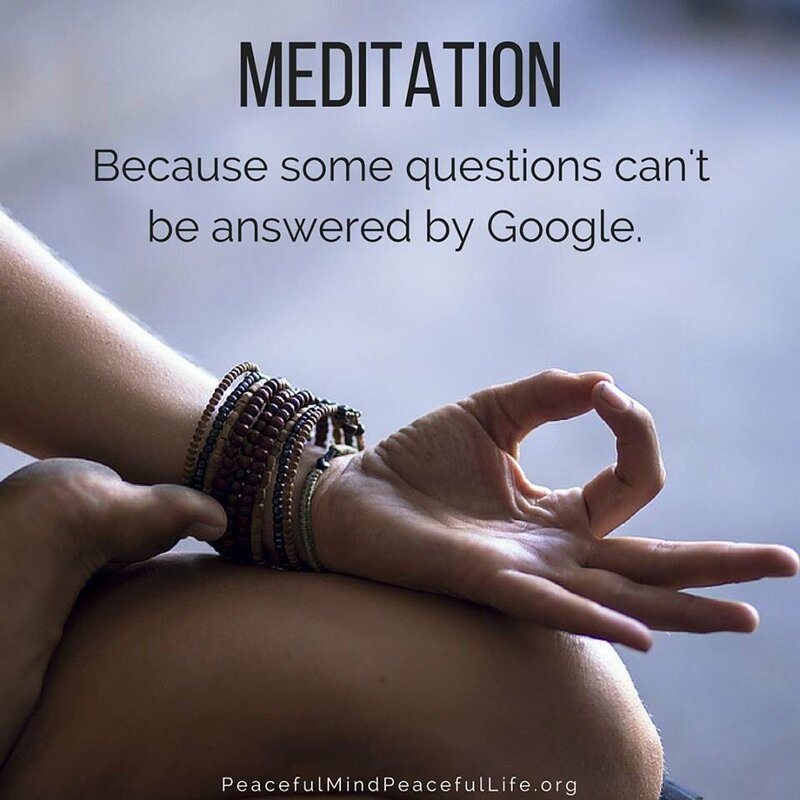 Want to learn more about how to Meditate? Join the Meditation Museum every Saturday. Free Intro to #Meditation Workshops from 11:00am - 12:00pm in Maryland 9525 Georgia Ave. Silver Spring, MD, walking distance from the Forest Glen Metro, and in Virginia from 9:30am-10:30am and 2pm-3pm at 1984 Chain Bridge Rd. McLean, VA, walking distance from the Greensboro Metro. RSVP for either location on their website, just click on the calendar for the list of classes. ON VIEW: Here is a great list of Free, donation-based and low-cost things you can do "Off The Mall"
Explore DC "Off The Mall" Here are some ideas! Lots of Free, discount and low-cost venues! Did you know? Free in DC has it's own CultureCapital Inside-Out page on CultureCapital listing free events and exhibitions on view! If you've never been to or heard of the Pepco Gallery in Chinatown, Joan Hisaoko Healing Arts Gallery on U St, Honfleur Gallery in Anacostia and the Meditation Museum in Silver Spring, you might want to check them out as well. Museums and other places "Off The Mall"
Free if you just want to hang out in the space, $8 - $5 if you want to see any of the exhibits on view. The building itself is a beautiful space, huge ceilings, cafe, and one of DC's best gift shops. Photographer Ansel Adams was a Wilderness Society council member and supported the organization for more than four decades. Throughout his career, he photographed dozens of iconic portraits of wildlands, such as Alaska’s Denali and California’s Yosemite. Before his death in 1984, Adams gave 75 signed, original images to The Wilderness Society. Since that time the collection has grown to a total of 88 landscape photographs and one portrait of Adams by photographer Arnold Newman. Hours: Monday - Thursday 10:00am - 4:00pm, Friday 10:00am - 2:00pm. Closed, weekends and federal holidays. Did you know that they Phillips is by donation during the week? Permanent collection only. Click link above for detailed post on Free in DC. Metro: Metro Center or take any of the S buses along 16th St that run to 13th & NY Ave.
DC's most unusual and quirky museum if you ask me! Great for all ages. The basic "Self-Guided/Gift Shopping/Book Tour"
Create your own adventure when you explore the museum and its collection of more than 20,000 books and other donated items on your own. Search through 100 rooms and 32 secret doors for new titles, rare volumes, or your all time favorites! Get 2 free books of similar value for every 10 you purchase. Most titles are priced $5 or less. 10% discount off other items (antiques excluded). P.S. Looking to get out of the house? Here is a list of Coffee Shops and Cafes with Free Wi-Fi! Updated December 29, 2015. Here is a list of coffee shops and other spots with free wireless internet in DC, and parts of VA and MD. I am sure there are more I haven't listed yet... Please add any additional locations in DC or next to a metro in MD or VA along with the address, area, and link if you have it in the comment section and I will add it to the list! If you know of any changes, please let me know of those as well. You can comment tweet me @FreeinDCBlog or message me on Free in DC's facebook page or send an email to freeindcblog@gmail.com if you have any updates to this list (new places or places listed here that may be closed, etc...) Thanks! My personal favorite independent coffee shops to work from, listed alphabetically: Blind Dog Cafe, Bourbon, Chinatown Coffee, Coffy Cafe, Filter, Flying Fish, Pleasant Pops, Tryst, Tynan and Vigalante. All are self serve except for Tryst which has waiter service. For ease of use, this list is organized alphabetically by neighborhood, and rest is alphabetical too. Now Renovated! "Cafe, Bookstore, and Community Space - Rooted in Adams Morgan Since 1960"
now serving beer, wine and absinthe! At Park Rd, across from the Tivoli large community space, retro vibe. one of DC's very first coffeeshops! "crop to cup" beans from Rwanda! Super comfy, nice decor! Great story/mission. try the ice kaffe in summer - ice cream + espresso! Cupcakes and coffee, the only indie coffee shop in the area. Dolcezza - New location with late night hours! 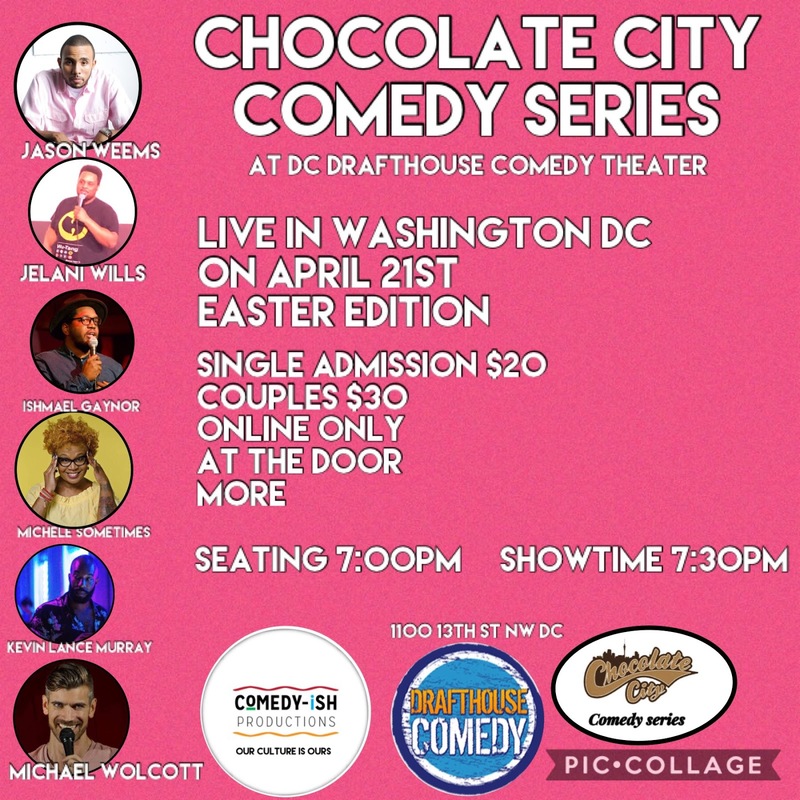 Metro: best reached by the Circulator bus, Woodley-McPherson route that also goes up 14th St and by the Columbia Heights Metro, right to 14th & RI Ave or P St, you can also take any bus along 14th St.
One of the newest places in DC, beans roast in house! Interesting story behind this place too, learn more here. See their website for hours and more info. OUTDOOR PARKS with Free WiFi! Yes, there is Free Wifi in the Park! All Barnes and Noble's now offers free wifi! Locations in MD and VA, all DC stores have closed unfortunately. Clarendon, Bethesda, Springfield and Rockville are close to metro I believe. Tysons Corner, Seven Corners and Potomac, car required. locations throughout the city and in MD and VA! IHOP - Open 24 hours! New: Apparently, most all of the McDonalds in the area now have offer free wireless internet! To see which ones in the area have wi-fi and to learn more, please click here. You'll want to type in your zipcode and look for the ones with a green box on the far right. 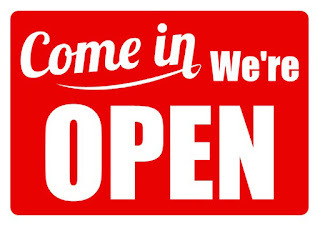 beer, billiards, sandwiches, open late! Great quiet places to work throughout DC! View the list of Library locations! I was thrilled to discover this one in Arlington! Try their 9:30 cupcake, it is so good! 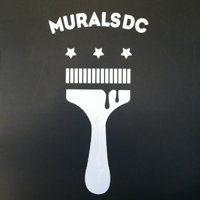 ON VIEW: ART: MURALS: Check out some great Murals throughout DC! Find murals in DC at these, and other locations. If you haven't been to the Meditation Museum before, this unique space recently moved to a new location in MD, a short walk from the Forest Glen Metro. In addition to the museum space, which features art ranging from pictures, posters, paintings and sculptures, designed to remind us of our true, highest selves and our responsibility to humanity, there are also lots of workshops and events offered at the Meditation Museum that are all free of charge! To see a list of upcoming free workshops and events at the museum, please visit their website at MeditationMuseum.org. You can also stay connected to the museum and their upcoming events through Meetup, facebook and twitter. Note: They just moved! Further north in MD but a short walk from the metro, just a few blocks. 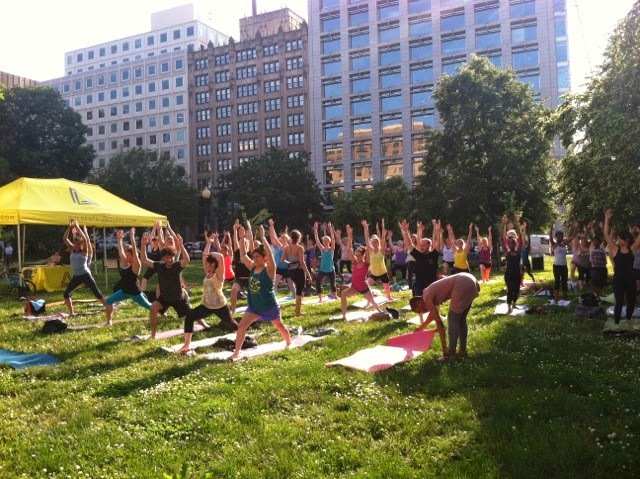 PAST: PILATES + YOGA: The Final Free Class in the "Pilates in the Park" series will be Yogalates on TUES, Sept 29 in Farragut Square from 5:30pm - 6:30pm, Thanks to Golden Triangle BID for this series! Arrive and check-in by 5:20 p.m. and be entered to win special prizes. Final Class of the Series! 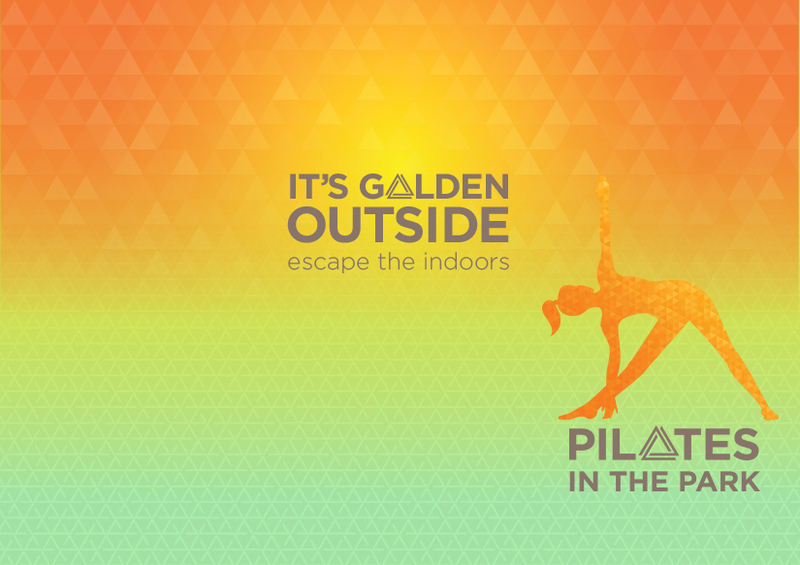 Join the Golden Triangle BID every Tuesday and Thursday evening this spring for free Pilates and Yogalates class in Farragut Square Park. Instruction will be provided by certified Pilates and Yogalates instructors. Bring your own mat and enjoy these fun and relaxing after work exercise sessions with the Golden Triangle BID. Note: Weather Permitting in the Park. In case of weather-related location or scheduling changes, please check the Golden Triangle website or connect with them on twitter @GoldenTriDC or on the GoldenTriangleDC page on facebook. Read more about what to expect and see festival map! See pics from past events! Check out the flickr album from years past to get a sense of the space and what to expect. Pictures really do say a lot about this festival. 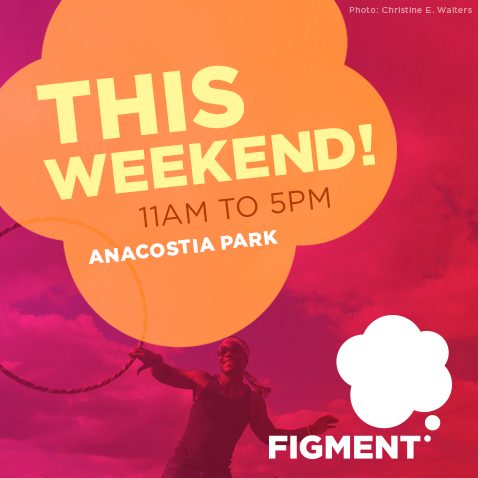 FIGMENT DC is a free, two-day event that will transform the beautiful outdoor space of Anacostia Park into a magical, colorful playground! Adults and kids are invited to come out and play! 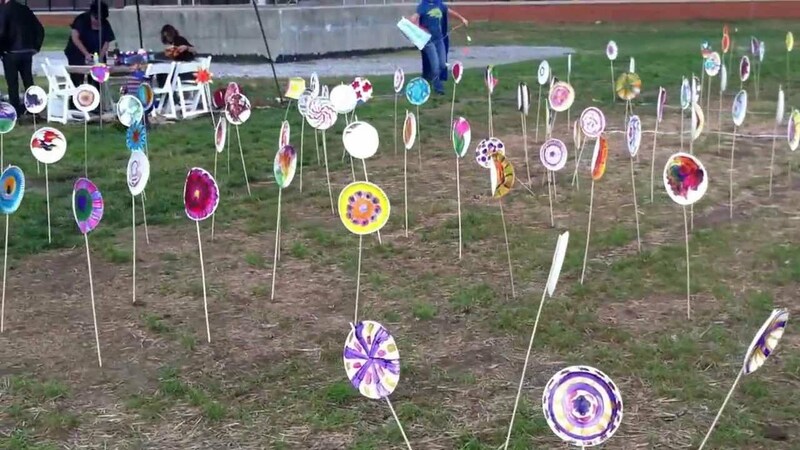 Create, and learn with and from your neighbors and help to transform this beautiful urban park into a magical, family-friendly, artists' wonderland! 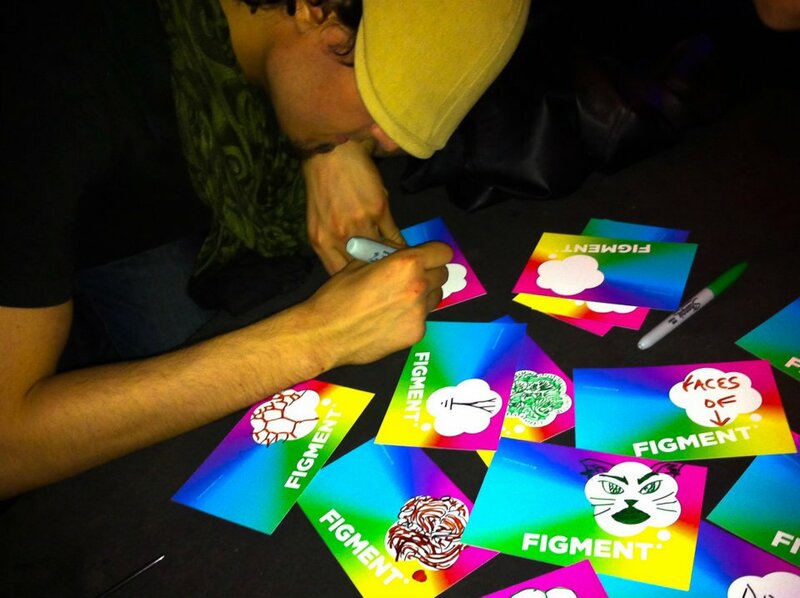 Come out with your games, colorful outfits and smiles, because you help to create FIGMENT. Inspired by Burning Man and keeping with the Burner principles, nothing is for sale and there is no corporate sponsorship. Again this year, over 40 local DC and DMV area artists will present collaborative art projects and events at FIGMENT DC, ranging across diverse media including music, sculpture, visual art and mixed media, earth works, dance and movement, and story-telling. This year Camp Contact might have some Acro Yoga and Contact Improv going on Sunday, possibly on Saturday as well. FIGMENT is a festival designed to bring imagination to life. There will be all kinds of art forms and activities, and you are encouraged to bring your own as well! FIGMENT is the perfect time to play make-believe (for both kids & adults!) so feel free to dress up in whatever creative costume or outfit you want! You can also bring along toys: Hula hoops, poi, croquet sets, knitting, water guns, games – anything that you want to play with or invite others to join you in! Dogs are welcome if they are friendly, but must be kept on a leash. Please clean up after your pooch! Have Roller skates? Bring them if you like, there is a covered roller rink on site! Feel free to come on your bike and consider decorating it with streamers, lights, fake fur, or other art, Burning Man style! 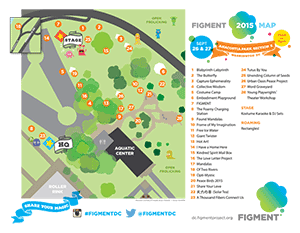 FIGMENT DC is a participatory festival that is volunteer run, non-profit and non-commercial. FIGMENT started in New York City and now takes place in a bunch of others cities. Learn more about the history of FIGMENT here and read more about the FIGMENT principles, which are very similar to the Burning Man Principles, here. FIGMENT is a 501(c)(3) not-for-profit organization entirely funded by grants and individual donations. FIGMENT accepts no corporate sponsorship of any kind. Note also that this is a “Leave No Trace” event, inspired by the Ten Burning Man Principles. While trash and recycling receptacles will be on-site, they ask you all that if you bring it in with you, please carry it out. This includes cigarette butts, which fit quite well in a small metal box in your pocket. Another principle they are asking attendees to be aware of is Decommodification, which means that the festival is run without any commercial sponsorships, transactions, or advertising. As this is a non-commercial event, there will not be any concessions of any kind on site. Please come prepared with your own water, snacks and refreshments! The event will have porta-potties/restrooms. Please refrain from bringing any grills, alcohol and drugs. Please do bring your curiosity, playfulness, an open mind and your creative spirit! Anacostia Park is a beautiful urban park along the east side of the Potomac River in DC. Conveniently located near the Potomac Ave and Anacostia Metro stations, the North Field is accessible from bike paths and I-395. There is some parking on site. If you are driving there, please review the directions to get to the park, as we know that GPS systems can frequently be wrong. If you want to attend and don't own a bike, there is Capital BikeShare station right at the Potomac Ave Metro station but there is not one at the park so you can either keep the bike with you and pay for time or drop it at the closest station, at Pennsylvania & Minnesota Ave SE, which is still about a 15 minute walk from the park. If you don't want to walk from the metro, it should be a short, and affordable taxi ride, especially if you share it with others. Metro: Anacostia or Potomac Ave. It's 1.2 miles from the Potomac Ave Metro, and a lovely walk over the Pennsylvania Ave bridge, see walking map. If you're biking, google recommends a slightly different bike route from the metro - yes, you can take your bike on the metro at no extra cost. There’s a bike trail to follow, but please keep an eye out for traffic! After you cross the bridge, turn left onto the Anacostia Riverwalk Trail before you get to 295, then turn right onto the path along the river. Look for a large covered pavilion – it’s the roller rink, and it’s hard to miss!